Mega Man Xtreme 2, known as Rockman X2: Soul Eraser​ (ロックマンX2 ソウルイレイザー) in Japan, is a video game developed by Capcom for the Game Boy Color handheld game console. It is a spin-off title in the Mega Man X series and is a direct sequel to Mega Man Xtreme, released the previous year. Chronologically, it seems to take place between Mega Man X3 and Mega Man X4, sometime after Mega Man Xtreme. 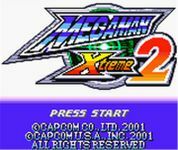 The game works similarly to the first Mega Man Xtreme title, except that the player can choose between playing as X and playing as Zero. Both have special skills that help them through the stages, but each also has weaknesses as well. X uses his X-Buster to shoot enemies from a distance. It can be charged up to three levels. Zero uses his Z-Saber for close-range combat. He risks taking damage more often by getting closer to enemies, but his slashes are more damaging than X's bullets. The major change in this game is that X and Zero do not both gain a weapon when a boss is defeated; only the player used to destroy the Maverick will get the special weapon. This adds a hint of strategy to the gameplay, as one must consider not only the order in which they will fight each boss, but whether X or Zero's gained weapons will prove more effective later on, and which are needed to reach power-ups. Also, after each level, the DNA souls gathered in the level will accumulate, which the player can use to buy power-ups from Iris. A difficulty setting called "Extreme Mode" can be unlocked where the player can utilize both X and Zero on any level and can gain different weapons depending on which bosses they defeat. The final boss of this mode is Sigma. Source: Wikipedia, Mega Man Xtreme 2 , available under the CC-BY-SA License.